Fors, Hjalmar 2014. Elements in the Melting Pot: Merging Chemistry, Assaying, and Natural History, Ca. 1730–60. Osiris, Vol. 29, Issue. 1, p. 230. Wakefield, R. Andre 2000. Police Chemistry. Science in Context, Vol. 13, Issue. 02, p. 231. Roberts, Lissa 1995. The death of the sensuous chemist: The ‘new’ chemistry and the transformation of sensuous technology. Studies in History and Philosophy of Science Part A, Vol. 26, Issue. 4, p. 503. Albury, W. R. 1972. “The Logic of Condillac and the Structure of French Chemical and Biological Theory 1780–1801.” Ph.D. diss. Johns Hopkins University. Anderson, Wilda. 1984. Between the Library and the Laboratory: The Language of Chemistry in Eighteenth-Century France. Baltimore: Johns Hopkins Uni versity Press. Baumé, Antoine. 1773. Chymie expérimentale et raisonnée. Paris. Bensaude-Vincent, Bernadette. 1983. “A propos de ‘Méthode de nomenclature chimique': Esquisse historique suivie du texte de 1787.” Cahiers d'Histoire et de Philosophie des Sciences 6. Bergman, Torbern. 1780–1985. Opusculeschymiquesetphysiques.… Translated by Guyton, de Morveau. Paris. Bergman, Torbern. 1783. An Essay on the Usefulness of Chemistry and Its Application to the Various Occasions of Life. Translated by Jeremy, Bentham. London. Bergman, Torbern. 1785. A Dissertation on Elective Attractions. London. Bergman, Torbern. 1788. Physical and Chemical Essays. Translated by Edmund, Cullen. London. Boerhaave, Herman. 1735. Elements of Chemistry, vols. 1 and 2. Translated by Dallowe, Timothy, M.D. London. Christie, J. R. R., and Golinski, J. V. 1982. “The Spreading of the Word: New Directions in the Historiography of Chemistry.” History of Science 20:235–66. Condillac, Etienne Bonnot de. 1971. An Essay on the Origin of Human Knowledge. Edited by Weyent, Robert G.; translated by Thomas Nugent. Gainesville: Scholars Facsimiles and Reprints. Condillac, Etienne Bonnot de. 1980. Logic. Translated by Albury, W. R.New York: Abaris. Crosland, Maurice. 1978. Historical Studies in the Language of Chemistry. New York: Dover. Dagognet, François. 1969. Tableaux et langages de la chimie. Paris: Editions du Seuil. Derrida, Jacques. 1973. L'Archéologie du frivole. Paris: Galilee. Gillispie, Charles C.. ed. 1970–1980. Dictionary of Scient Biography. 16 vols. New York: Scribners. Fourcroy, Antoine-Francois. 1785. Elementary Lectures on Chemistry and Natural History. Translated by Elliot, Thomas. Edinburgh. Fric, René. 1960. “Contribution a l'étude de l'évolution des idées de Lavoisier sur la nature de l'air et sur la calcination des métaux.” Archives Internationales d'Histoire des Sciences 47:155–62. Furet, François. 1978. Penser la Révolution Française. Paris: Gallimard. Galison, Peter. 1985. “Bubble Chambers and the Experimental Workplace. In Observation, Experiment and Hypothesis in Modern Physical Science, edited by Peter, Achinstein and Owen, Hannaway, 309–73. Cambridge, Mass. : MIT Press. Geoffroy, E. F. 1718. “Table des différents rapports observes en chimie entre différentes substances.” Mémoires de l'Académie royale des sciences, 202–12. Paris. Golinski, Jan. 1992. Science as Public Culture: Chemistry and Enlightenment in Britain, 1760–1820. Cambridge: Cambridge University Press. Gough, J. B. 1988. “The Fulfillment of the Stahlian Revolution.” Osiris 4:15–33. Guerlac, Henry. 1976. “Chemistry as a Branch of Physics: Laplace's Collaboration with Lavoisier.” Historical Studies in the Physical Sciences 7:193–276. Guerlac, Henry. 1982. Memoir on Heat. A translation of Mémoire sur la chaleur (1783) by Lavoisier and Laplace. New York: Neale Watson Academic Publications. de Morveau, Guyton, Louis, Bernard. 1782. “Mémoires sur les dénominations chymiques.” Observations sur la Physique. 19:370–82. de Morveau, Guyton, Louis, Bernard, Hughes, Maret, and Jean, Durande. 1777. Elémens de chymie théorique et pratique.… Dijon. de Morveau, Guyton, Louis, Bernard, de Lavoisier, Antoine Laurent, Antoine-François, Fourcroy, and Berthollet, Claude Louis. 1787. Méthode de nomencla ture chymique. Paris. Hannaway, Owen. 1975. The Chemists and the Word. Baltimore: Johns Hopkins University Press. Heidegger, Martin. 1962. Being and Time. Translated by MacQuerrie, John and Robinson, Edward. New York: Harper and Row. Heidegger, Martin. 1977. “The Question Concerning Technology.” In The Question Concerning Technology and Other Essays, translated by Lovitt, William. New York: Harper and Row. Holmes, F. L. 1985. Lavoisier and the Chemistry of Life. Madison: University of Wisconsin Press. Holmes, F. L. 1989. Eighteenth-Century Chemistry as an investigative Enterprise. Berkeley, Calif.: Office for History of Science and Technology. Hufbauer, Karl. 1982.The Formation of the German Chemical Community (1720–1795). Berkeley, Calif.: University of California Press. Hunt, Lynn. 1984. Politics, Culture and Class in the French Revolution. Berkeley, Calif.: University of California Press. Keir, James. 1789. The First Part of a Dictionary of Chemistry. Birmingham: Pearson and Rollason. Kirwan, Richard. 1789. An Essay on Phlogiston. London. Antoine Laurent de, Lavoisier. 1789. Traité élémentaire de chimie. Paris. Antoine Laurent de, Lavoisier. 1965 Elements of Chemistry. Translated by Kerr, Robert. Introduction by Douglas McKie. New York: Dover. Antoine Laurent de, Lavoisier. 1862–1993. Oeuvres. Paris. Antoine Laurent de, Lavoisier, and Marquis de Laplace, Pierre Simon  1982. Mémoire sur la chaleur. Translated as Memoir on Heat by Guerlac, Henry. New York: Neale Watson. LeClerc, George-Louis, de Buffon, Comte. 1767. Natural History, vol. 10. London. Leicester, H. M., and Klickstein, H. S., eds. 1968. A Sourcebook in Chemistry 1400–1900. Cambridge, Mass. : Harvard University Press. Lundgren, Anders. 1988. “The New Chemistry in Sweden: The Debate That Wasn't.” Osiris 4:146–68. McEvoy, John. 1978. “Joseph Priestley, ‘Aerial Philosopher’: Metaphysics and Methodology in Priestley's Chemical Thought, Parts 1–3.” Ambix 25:1–55, 93–116, 153–75. McEvoy, John. 1979. “Joseph Priestley, ‘Aerial Philosopher,' Part 4.” Ambix 26:16–38. Meihado, Evan. 1985. “Chemistry, Physics, and the Chemical Revolution.” Isis 76:195–211. Ozouf, Mona. 1976. La Féte révolutionaire, 1790–1799. Paris: Gallimard. Perrin, Carleton. 1981. “The Triumph of the Antiphiogistians.” In The Analytic Spirit: Essays in the History of Science in Honor of Henry Guerlac, edited by Harry, Woolf, 40–63. Ithaca, N.Y.: Cornell University Press. Pinch, Trevor. 1985. “Toward an Analysis of Scientific Observation: The Exter nality and Evidential Significance of Observational Reports in Physics.” Social Studies of Science 15:3–36. Priestley, Joseph. 1767. The History and Present State of Electricity, with Original Experiments. London. Priestley, Joseph. 1790. Experiments and Observations of Different Kinds of Air…. In Three Volumes: Being the Former Six Volumes…, Vol. 1. Birmingham. Priestley, Joseph. 1802. The Doctrine of Phlogiston Established and That of the Decomposition of Water Refuted, 2nd ed.Northumberland, Pa.
Roberts, Lissa. 1990. 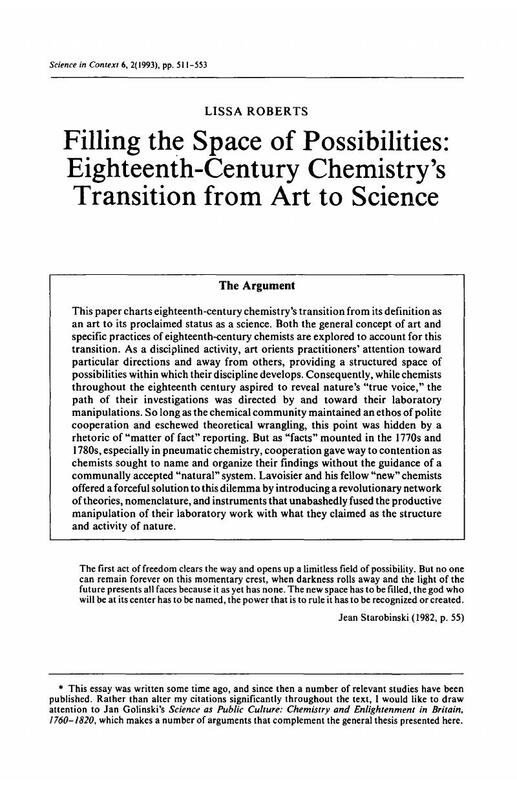 “Setting the Table: The History of Eighteenth-Century Chemistry as Read through Its Tables.” In The Literary Structure of Scient Argument: Historical Studies, edited by Peter, Dear, 99–132. Philadelphia: University of Pennsylvania Press. Roberts, Lissa. 1991. “A Word and the World: The Significance of Naming the Calorimeter.” Isis 82:199–222. Roberts, Lissa. 1992. “Condillac, Lavoisier, and the Instrumentalization of Science.” In The Chemical Revolution: Context and Practices, edited by Lissa, Roberts. The Eighteenth Century: Theory and Interpretation 33:252–71. Maximilien de, Robespierre. 1968. “Report on the Principles of Political Morality.” In The French Revolution, edited by Paul, Beik, 276–88. New York: Harper and Row. Schaffer, Simon. 1989. “Glassworks: Newton's Prisms and the Uses of Experiment.” In The Uses of Experiment, edited by David, Gooding, Trevor, Pinch, and Simon, Schaffer, 67–104. Cambridge: Cambridge University Press. Shapin, Steven. 1984. “Pump and Circumstance: Robert Boyle's Literary Technology.” Social Studies of Science 14:481–520. Shapin, Steven. 1989. “The Transparent Artisan.” American Scientist 77:554–63. Shaw, Peter. 1734. Chemical Lectures. London. Siegfried, Robert. 1982. “Lavoisier's Table of Simple Substances: Its Origin and Interpretation.” Ambix 29:29–48. Stahl, G. E. 1730. Philosophical Principles of Universal Chemistry. Translated by Shaw, Peter. London. Starobinski, Jean. 1982. 1789:The Emblems of Reason. Charlottesville: University of Virginia Press. Taton, René, ed. 1986. Enseignement et d des sciences en France au XVIIIe siècle. Paris: Hermann. Venel, G. F. 1753. “Chymie.” In Encyclopédie, edited by Denis, Diderot and Jean, d'Alembert, 3:408–37. Paris.